Is canine parvovirus (CPV) the "plague" of the animal sheltering world? It often seems like that is the case. It certainly can be devastating to animal health and welfare and can bring even the best-equipped shelter to its knees. Although we have not yet discovered the "silver bullet" to cure this illness, there have been many advances in treatment options since the emergence of CPV in the 1970s. Many sheltering organizations have started to embrace various CPV treatment options in their efforts to save more lives. But is treatment of CPV the right move for your organization? Which treatments are effective? How can you make use of limited resources without compromising patient welfare? This article will explore those questions as they relate to the treatment of individual animals with CPV in a shelter setting. Given the highly infectious and deadly nature of CPV, having the physical capacity to prevent transmission of the virus to other animals is of the highest importance. When treatment is performed on-site, this is most commonly accomplished through the use of a bio-secure, self-contained isolation unit. If such a unit is not available, outpatient treatment with a skilled foster parent under veterinary guidance may be appropriate in select cases. In addition to appropriate physical facilities, humane treatment of CPV requires significant medical expertise. Veterinary input is essential, as is a well-trained, experienced corps of staff members and/or volunteers. Treatment of CPV also often requires a significant investment of time to ensure adequate patient monitoring and administration of treatments multiple times per day. In addition, recovered dogs can continue to shed virus for up to 2 weeks, so appropriate housing and care will need to be sustained after the immediate threat is gone.4 All of these things must be accomplished without compromising or neglecting the myriad other responsibilities that shelters and shelter workers attend to on a daily basis. 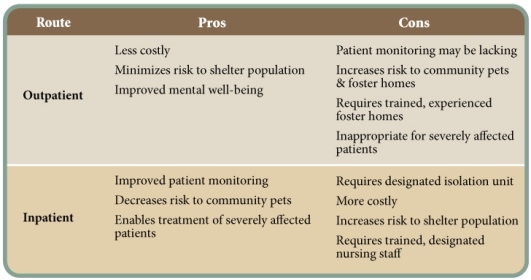 Figure 1 describes one method of determining whether your organization is ready to treat CPV through a shelter-based protocol or whether a private veterinary clinic should be utilized. In addition to assessing your physical, staffing, temporal and financial resources, an individual animal welfare assessment should be made. It is a mantra in veterinary medicine that "the treatment should not be worse than the disease." This is a very real possibility in severe cases of CPV, therefore the decision of whether or not to treat CPV should also consider the benefit of treatment to that particular animal. Undertaking a course of treatment for animals that have a good prognosis and establishing objective parameters of unacceptable welfare conditions to define treatment end points will help ensure your treatment protocol is successful and respected. The treatment of CPV centers on avoiding and correcting dehydration, preventing secondary bacterial infections and treating endoparasites, ensuring adequate nutrition, and alleviating discomfort to enhance welfare and speed recovery. Managing each of these components is essential to a positive outcome and all should be given equal importance. Environmental management and good biosecurity practices are also critical components of a CPV treatment plan and, although their discussion is beyond the scope of this article, their importance cannot be underestimated. Note: The treatment plans discussed below apply only to patients that are hemodynamically stable. Patients that are non-responsive or have signs of septic or hypovolemic shock (e.g., white gums, shallow respiration, and weak pulse) should receive immediate evaluation by a licensed veterinarian or be humanely euthanized. Dogs infected with CPV quickly become dehydrated due to vomiting, diarrhea and anorexia.3 The first step in correcting dehydration is to estimate the percentage of fluid loss that has already occurred. 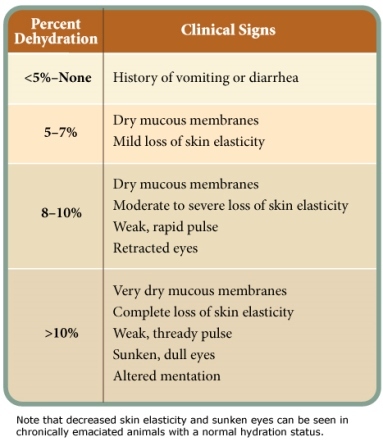 Parameters for subjectively assessing the percentage of dehydration are provided in Table 1. Table 1. Estimating Percent Dehydration7. 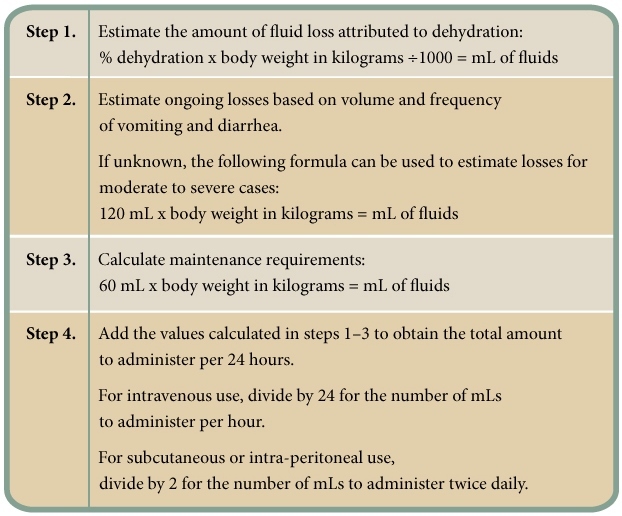 In addition to the amount needed to correct dehydration, the total amount should also include estimated ongoing losses (through continued vomiting and diarrhea) and normal maintenance requirements (Figure 2). The route of fluid administration should be given careful consideration. Intravenous administration is the preferred route as it is the quickest, most effective method of restoring and maintaining normal hydration status. However, intravenous catheter maintenance requires significant nursing care to prevent complications. In one veterinary teaching hospital, 22% of intravenous catheters from CPV patients were contaminated with bacteria.9 Alternatives to intravenous fluid administration include intraosseous, subcutaneous and intraperitoneal routes.10, 11 The pros and cons of each route of administration are presented in Table 2. Therefore, supplemental potassium should be included in fluids after initial rehydration is complete. Caution should be taken when supplementing potassium levels as both too little and too much potassium can result in cardiac arrhythmias. Periodic measurement is essential to maintaining serum potassium levels within a safe range. When intravenous formulations of potassium are not available or feasible, oral formulations may be utilized in the absence of vomiting. Hypoglycemia is another expected consequence of CPV infection. Low blood glucose levels are of particular concern in puppies and toy breeds due to lack of food intake, inadequate glycogen stores and as a consequence of sepsis. A 2.5% - 5% solution of dextrose can be added to replacement fluids to maintain normal blood glucose concentrations (add 50 - 100ml of 50% dextrose per liter of replacement fluids). If treatments are administered via subcutaneous or intraperitoneal routes, dextrose should be mixed within a fluid bolus to prevent tissue irritation and discomfort. The injection site should be cleaned prior to administration to minimize the risk of introducing infection.4 When injectable dextrose solutions are not available or feasible, blood glucose levels can be maintained by the oral administration of corn syrup. As with electrolytes, periodic measurement of blood glucose levels is helpful in ensuring the appropriate dose and frequency of supplementation. Destruction of intestinal villi can lead to loss of protein through the gastrointestinal tract. Treatment of hypoproteinemia is indicated if serum albumin decreases below 1.5 g/dL or total protein decreases below 3.5 g/dL. This can be recognized clinically by the presence of pitting edema. Administration of natural (e.g., whole blood or plasma) or synthetic (e.g., hetastarch or dextran 70) colloids can be used to combat hypoproteinemia once hydration levels are corrected. Traditionally, most veterinarians recommend withholding food and/or water anywhere from 12 to 72 hours when presented with a vomiting patient.3, 16 In the case of CPV, there is evidence that feeding these patients as soon as their vomiting is controlled may be beneficial. One scientific study demonstrated that CPV-infected dogs fed through a nasoesophageal feeding tube showed clinical improvement, gained weight and recovered their intestinal tract function quicker than CPV-infected dogs that were fasted for 12 hours after vomiting was controlled.16 In lieu of placing a feeding tube, this effect can be replicated by offering patients a small amount of gruel (i.e., canned food mixed with water to make slurry) at multiple time points throughout the day. The severe vomiting and diarrhea that often accompany CPV infection can lead to considerable nausea and pain. In addition to causing such discomfort, continued vomiting can lead to gastroesophageal reflux, worsening dehydration and a delayed recovery. Practically speaking, vomiting also prevents the administration of oral medications and the re-introduction of food. A variety of injectable antiemetics and gastroprotectants are available for these purposes.3 A once daily, centrally-acting injectable antiemetic (maropitant citrate) has recently shown promise for use in treatment of CPV-associated nausea and vomiting.18 Pain management can be achieved with opioids and similar compounds. In severe cases, constant rate infusions of injectable analgesic cocktails may be indicated. The use of non-steroidal anti-inflammatory drugs should be avoided until hydration status has stabilized. A variety of other treatment modalities have been investigated for use in CPV cases with mixed results. The final component of a CPV treatment plan is monitoring of the patient's response to treatment efforts and re-assessment of the patient's disease status. Continual re-evaluation of the patient ensures that his or her medical and welfare needs are being met and allows for adjustment in treatment strategies based on the patient's individual response. The frequency and depth of monitoring will vary based on many factors including the severity of the disease, the availability of veterinary input, and the diagnostic capabilities of the organization. 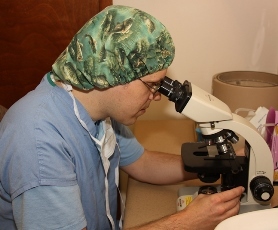 It is not unusual for a CPV patient to require four or more evaluations in a 24-hour period. Such protocols should be developed on an individual patient basis with veterinary oversight. At a minimum, treatment monitoring must include a thorough physical examination by a trained, experienced veterinary staff member twice daily. In some moderately to severely affected patients, more in-depth diagnostics are warranted and may include analysis of packed cell volume, total solids, white blood cell count, blood glucose and electrolyte levels. 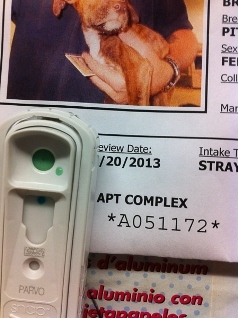 Once it is determined that the resources to undertake a shelter-based CPV treatment protocol are available, the next step is to decide which patients can safely be treated in a foster home or other facility without veterinary staff on site (i.e., as "outpatients"), and which patients must be treated within the shelter's medical unit with constant veterinary staff supervision (i.e., as "inpatients"). From the perspective of protecting the shelter population, outpatient treatment is best. However, from the patient perspective, inpatient treatment often affords a higher level of care. In severely affected patients, outpatient treatment is not a humane option. Table 3 lists the pros and cons of outpatient versus inpatient treatment protocols. For shelters attempting to initiate a CPV treatment protocol for the first time, it may be best to treat all patients as inpatients to allow the veterinary staff to assess treatment response and develop appropriate parameters for selecting future outpatients. It would also be prudent to select mildly affected patients for a new treatment program. This will help ensure that shelter staff is prepared, resources are sufficient, and protocols are fine-tuned for more intensive cases that will follow as the program develops. 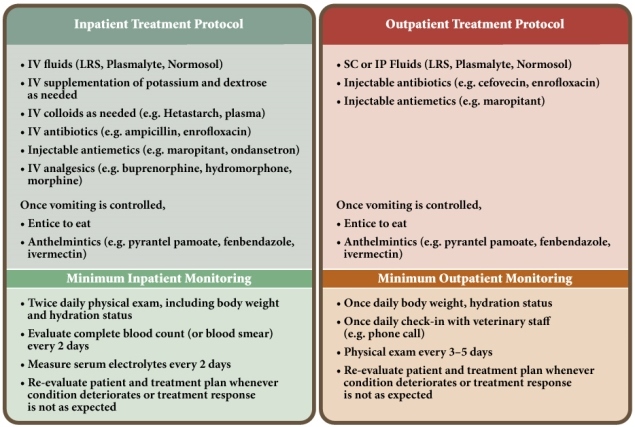 Figure 3 compares inpatient and outpatient treatment protocols and minimum treatment monitoring recommendations. In many communities across the United States, healthy shelter animals are now guaranteed a positive outcome. The next challenge for such communities is to address the needs of animals with medical and behavioral issues. Beginning a treatment program for dogs infected with CPV may be the next step toward meeting that challenge in your community. As a preventable disease, the implementation of strategies to avoid the introduction of CPV into the shelter population (such as vaccination on intake, population segregation, effective sanitation, etc.) are even more important than developing treatment plans. However, with careful planning and oversight, many CPV infected dogs once considered too difficult to treat by many sheltering organizations can be nursed back to health and enjoy the healthy, happy life that they deserve. 1. Wikipedia. Bubonic Plague. Accessed September 14, 2013. 2. Dufel SE. CBRNE - Plague. Accessed September 14, 2013. 3. McCaw DL and Hosking JD. Canine viral enteritis. In: Infectious Diseases of the Dog and Cat. 3rd Edition. Ed. Greene, CE. Saunders: St. Louis, 2006. P. 63-73. 4. Appel LD and Barr SC. Canine parvovirus and coronavirus. 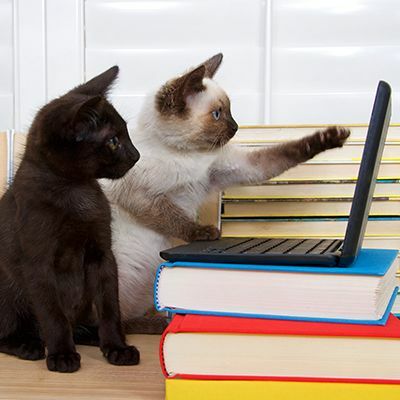 In: Infectious Disease Management in Animal Shelters. Eds. Miller L and Hurley K. Wiley-Blackwell:Ames, 2009. P.197-208. 5. Otto CM. Treating parvovirus (proceedings). Accessed September 14, 2013. 6. Otto CM, Drobatz KJ, Soter C. Endotoxemia and tumor necrosis factor activity in dogs with naturally occurring parvoviral enteritis. J Vet Intern Med. 1997 Mar-Apr;11(2):65-70. 7. The Merck Veterinary Manual. 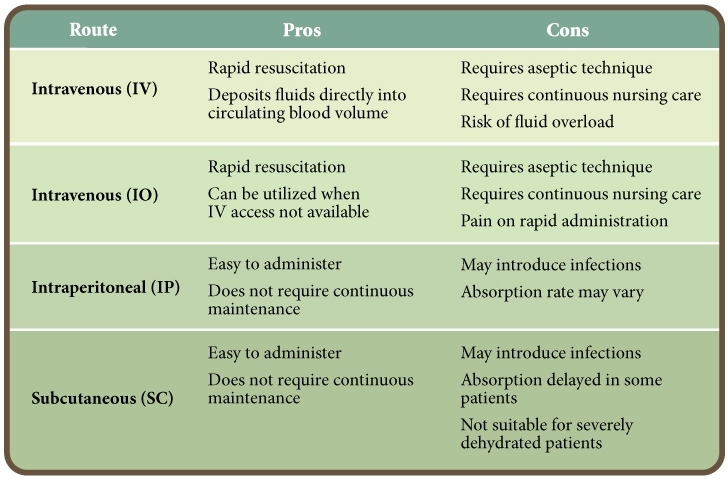 The Fluid Resuscitation Plan. Accessed September 14, 2013. 8. Macintire DK, Smith-Carr S. Canine Parvovirus. Part II. Clinical signs, diagnosis, and treatment. Compendium. 1997. Mar: 19(3). 9. Lobetti RG, Joubert KE, Picard J, et al. Bacterial colonization of intravenous catheters in young dogs suspected to have parvoviral enteritis. J Am Vet Med Assoc, 2002. 220:9, 1321-1324. 10. Goddard A, Leisewitz AL. Canine parvovirus. Vet Clin North Am Small Anim Pract, 2010. Nov;40(6):1041-53. 11. Hurley KF, and Griffin B. Canine parvovirus: diagnosis, population response, prevention and treatment. Proceedings, ABVP Symposium 2013. In press. 12. Barr SC. Canine Parvovirus: Are current vaccines effective against new strains? Accessed September 14, 2013. 14. Turk J, Miller M, Brown, T, et al. Coliform septicemia and pulmonary disease associated with canine parvoviral enteritis:88 cases (1987-1988 ). J Am Vet Med Assoc, 1990. 196:771-773. 15. Greene CE and Watson ADJ. Antibacterial chemotherapy. In: Infectious Diseases of the Dog and Cat. 3rd Edition. Ed. Greene, CE. Saunders: St. Louis, 2006. P. 274-301. 16. Mohr AJ, Leisewitz AL, Jocobson LS, et al. Effect of early enteral nutrition on intestinal permeability, intestinal protein loss, and outcome in dogs with severe parvoviral enteritis. J Vet Int Med, 2003. Nov-Dec;17(6):791-8. 17. Shmalberg, J. Personal communication. September 8, 2013. 18. Preisner K, Sullivan L, Boscan P. et al. Evaluation of an outpatient protocol in the treatment of canine parvoviral gastroenteritis. Proceedings. 2013 ACVIM Forum Research Abstracts Program. 19. Mischke R, Barth T, Wohlsein P, et al. 2001. Effect of recombinant human granulocyte colony-stimulating factor (rhG-CSF) on leukocyte count and survival rate of dogs with parvoviral enteritis. Res Vet Sci 70:221-225. 20. Rewerts JM, McCaw DL, Cohn LA, et al. Recombinant human granulocyte colony stimulating factor for treatment of puppies with neutropenia secondary to canine parvovirus infection. J Am Vet Med Assoc, 1998. 213:991-992. 21. Savigny MR, Macintire DK. Use of oseltamivir in the treatment of canine parvoviral enteritis. J Vet Emerg Crit Care (San Antonio), 2010. Feb;20(1):132-42. 22. Ishiwata K, Minagawa T, Kajimoto T. Clinical effects of the recombinant feline interferon-u on experimental parvovirus infection in Beagle dogs. J Vet Med Sci, 1998.60(8):911-7. 23. Martin V, Najbar W, Gueguen S, et al. Treatment of canine parvoviral enteritis with interferon-omega in a placebo-controlled challenge trial. Vet Microbiol, 2002. 89(2):115-27. 24. Mari K, Maynard L, Eun HM, et al. Treatment of canine parvoviral enteritis with interferon-omega in a placebo-controlled field trial. Vet Rec, 2003.152(4):105-8.